G-sharp major is a theoretical key based on the musical note G♯, consisting of the pitches G♯, A♯, B♯, C♯, D♯, E♯ and F . Its key signature has six sharps and one double sharp. 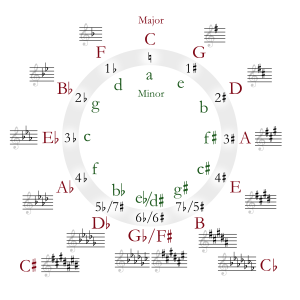 Its relative minor is E-sharp minor (usually replaced by F minor), its parallel minor is G-sharp minor, and its enharmonic equivalent is A-flat major. Although G-sharp major is usually notated as the enharmonic key of A-flat major, because A-flat major has only four flats as opposed to G-sharp major's eight sharps (including the F ), it does appear as a secondary key area in several works in sharp keys, most notably in the Prelude and Fugue in C-sharp major from Johann Sebastian Bach's The Well-Tempered Clavier, Book 1. The G-sharp minor prelude (and, in some editions, the fugue) from the same set ends with a Picardy third, on a G-sharp major chord. G-sharp major is tonicised briefly in several of Frédéric Chopin's nocturnes in C-sharp minor. A section in the second movement of Chopin's Piano Concerto No. 1 is in G-sharp major, although the key signature has four sharps. The end of the exposition of the second movement Charles-Valentin Alkan's Grande sonate 'Les quatre âges', subtitled Quasi-Faust, is in G-sharp major, albeit written with a six-sharp key signature (the movement opens in D-sharp minor and ends in F-sharp major). The final pages of A World Requiem by John Foulds are written in G-sharp major with its correct key signature shown in the vocal score including the F .
^ Thomas Busby (1840). "G-sharp major". A Dictionary of Three Thousand Musical Terms. revised by J. A. Hamilton. London: D'Almaine and Co. p. 55.